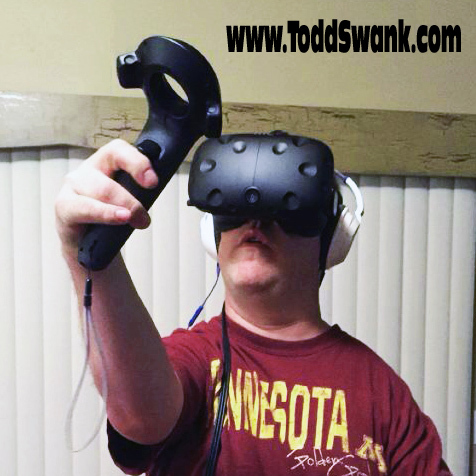 We received the new HTC Vive this week and are still blown away by it every time we try it! It is by far the best virtual reality we've ever experienced. We just had no concept how much adding the hand controllers and motion tracking would add to the experience vs previous demos we'd seen. We literally feel like we are entering a different world every time we use it! It's hard to believe this is Gen 1 technology. We can only imagine what we're going to be experiencing 5 years from now once the platforms have been more thoroughly developed. We truly believe this is going to be as big as a cultural shift as the one created by the advent of the PC in the nineties and the development of the internet in the 2000's. This is a video Luke Swank made featuring Avery Swank demonstrating some different VR Apps. It’s hard to show anyone the experience because it just looks like some lame video game, but watch him use his hands to pull back the arrow and shoot it. When you’re in there, your brain quickly starts to believe you have an actual bow and arrow in your hands. My son, Avery Swank, is an avid programmer who has been chomping at the bit to start developing in Virtual Reality for several months now. This is a screen shot of a futuristic basketball game he started working on after we received the Vive. It's pretty bizarre picking up and throwing a virtual ball into a basket. I found it even more fun when I realized I could just keep creating more and more balls and they just end up rolling all around me. I haven't tried filling up the whole room yet, but it's coming.